MONTGOMERY – The Alabama Medicaid Agency has been notified that Envolve, a wholly-owned subsidiary of Centene, is ending its agreement as a capital contributor with all five Alabama Healthcare Advantage (AHA) organizations that had planned to operate as Regional Care Organizations this fall. Alabama Medicaid Commissioner Stephanie Azar said the AHA organizations have notified the Agency that they intend to end their pursuit of full certification, pending a final decision by the five regional boards in the upcoming days. While the immediate result would be the loss of five probationary RCOs, the Agency is still in position to implement Regional Care Organizations by October 1, 2017, under a 2013 state law that allows current probationary RCOs to provide services in additional regions, Commissioner Azar said. The law requires the State to first offer existing probationary RCOs the opportunity to provide services in other regions if no RCOs are certified in a region. The withdrawal of AHA would leave Regions B, D and E (see map) without a certified RCO. The Agency has implemented a process to offer the vacant regions to other probationary RCOS. Two probationary RCOs have availed themselves of the process. Alabama Community Care – Region A and My Care Alabama have taken initial steps to qualify to offer services in these three regions. 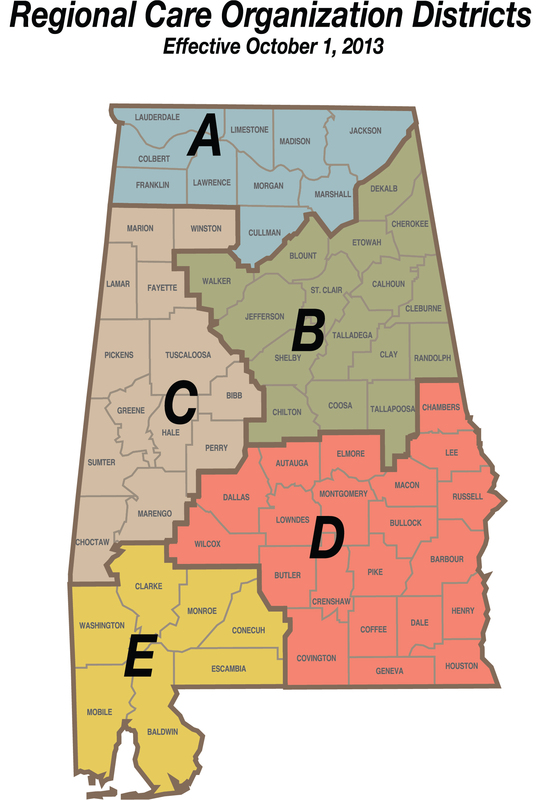 Both organizations are already probationary RCOs in the north Alabama region (Region A) and Alabama Community Care – Region C is also a probationary RCO in the western region of the state. Both have put in writing interest to provide services in Regions B, D, and E and are working closely with the Agency to accomplish this goal. As a result, he Agency has confidence that the state can have at least one certified RCO in each of the regions by October 1, 2017. If for some reason no probationary RCO becomes fully certified and contracts to offer services in these regions, then state law allows the state to offer “alternative care providers” the opportunity to operate in those regions. Governor Robert Bentley emphasized that Regional Care Organizations represent the best plan to transform the Medicaid healthcare delivery system in Alabama.